Can't find the right new baby wishes for a baby card? You've come to the right place. 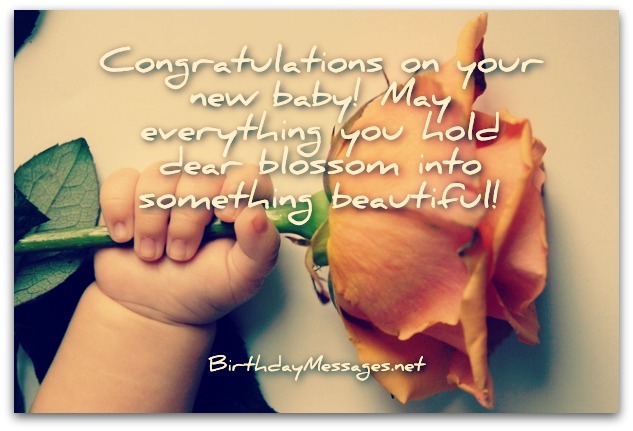 Here, choose from a huge collection of beautifully written, heartfelt baby card messages. When you don't know what to write as a baby card message, picking generic newborn baby boy or girl greetings may be a very tempting way to go, but it's not always the best route to take. Something personal is more in order. 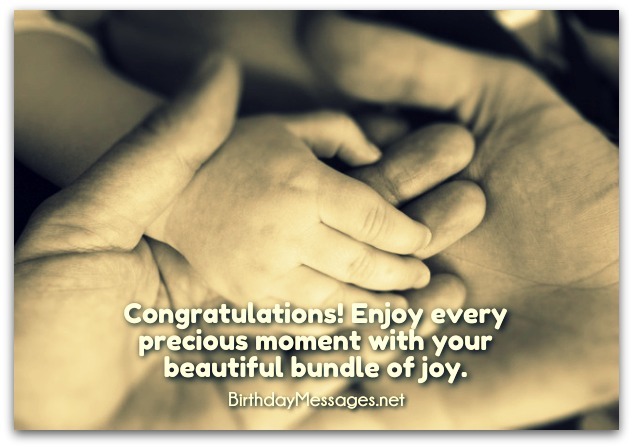 Use the personal baby greetings here as your baby messages for a card, text or eCard. You'll definitely find exactly what you need. You've already avoided the hard route — just by coming here and using my new baby wishes as your inspiration. You now have many messages to choose from. Now, you can take the easy route and, as I mentioned above, simply opt for generic (i.e. safe) baby greetings. You could get away with it because this type of message never offends anyone. If this is the kind of baby wish you want to send, you'll find a few below. But this is only for your convenience, if you can't find what you're looking for. To me, taking the easy route is simple but it's not great. Greatness comes from honestly (and eloquently) expressing your feelings about the new arrival. That requires originality. Since the words you select below will ultimately be your blessings to the new parents, adding your personal touch to your newborn wishes makes them truly special. 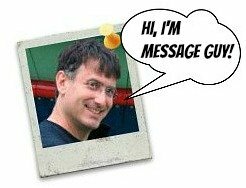 You'll find many original new baby messages on this page. This way, you can officially greet the new arrival and, at the same time, add to the joy of the new parents — with words that can read and appreciate over and over again. Teenage parents: Be congratulatory and inspirational (not patronizing or self-righteous). Adoptive parents: Be very thrilled, congratulatory and sentimental (no offensive surrogacy, adoption or infertility comments, not even in jest). LGBT parents: Be very thrilled, congratulatory and sentimental (no offensive surrogacy, adoption or homophobic comments, not even in jest). Single parents: Be congratulatory and inspirational (not patronizing or self-righteous). Infertile parents: Be very thrilled, congratulatory and sentimental (no offensive surrogacy, adoption or infertility comments, not even in jest). The next step? Just pick the baby message (or baby messages) that best express just what you want to say to the new parents (and how you want to say it, based on my suggestions above). This shouldn't be too hard to do. Congratulations! This is a truly amazing time in your life. It won't last forever, so enjoy every precious moment of every baby step and take as many photos as humanly possible. It's true: the little things we appreciate that provide us with life's greatest moments of joy! 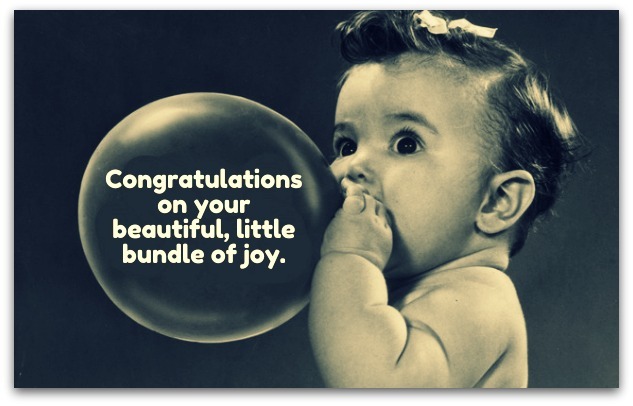 Congratulations on your little bundle of joy! Congratulations on the newest addition to your lovely family! Your little miracle will just make your home lovelier. Your life will never be the same again! It will be special every day. Lucky you. Congratulations on your little bundle of love and joy. With a baby comes all the things that truly matter. Enjoy every moment. Congratulations! So delighted to learn about the safe, healthy arrival of your two [three, four, five, six, seven, eight] bundles of joy! You are so blessed! Congratulations! Now you have the joy that only a double [triple, quadruple, quintuple, sextuple, septuple, octuple) dose of love can bring! Congratulations! True happiness and love times two [three, four, five, six, seven, eight]! There's nothing better in life. You know what they say: good things come in twos (threes, fours, fives)! Congratulations! Your two new arrivals are guaranteed a BFF — for life! Congratulations! Congratulations on your two [three, four, five, six, seven, eight] new arrivals! I bet you lost count of all those fingers and toes. Congratulations! You've been specially selected to receive an exclusive [2 for 1, 3 for 1, 4 for 1, 5 for 1, 6 for 1, 7 for 1] offer! Although you will definitely have 2X [3X, 4X, 5X, 6X, 7X, 8X] the tears and trouble, the years ahead will undoubtedly be 2X [3X, 4X, 5X, 6X, 7X, 8X] as wonderful. A very BIG congratulations. The recipe for 2X [3X, 4X, 5X, 6X, 7X, 8X] the happiness: 2X [3X, 4X, 5X, 6X, 7X, 8X] the new arrivals. Congratulations! You have more than one reason to rejoice: you have two [three, four, five, six, seven, eight] of them. Congratulations! Your precious little [boy, girl] is perfect — for you and you for [her, him]. Congratulations on your new arrival. [He, She] will make a beautiful addition to your lovely family. I know one thing for sure: you will make the life of your beloved little [boy, girl] simply and thoroughly amazing. [He, She] is so, so, so fortunate to have you. Seeing your dream of a family come true fills my heart with such joy. Your precious little one is a true blessing! A family like yours is what any child would love to have — and vice versa, of course. Congratulations on your new arrival! It has been a long road for you and On your journey to your new arrival, you've had to navigate a long and winding road. I'm so delighted to see that you've reached your destination. Congratulations on the newest addition to your family! We are very thankful to see you and your baby safe, healthy and happy. It just warms our heart that all is well. 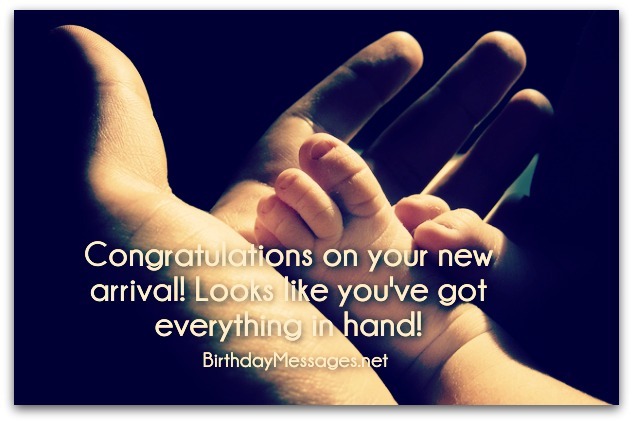 Congratulations on the arrival of your baby [boy, girl]! [He, She] is now safe, sound and incredibly lucky in your loving hands. Your precious little bundle is beautiful beyond compare. [He, She] is — and will be — a blessing to you and your entire family in more ways than you or I can even imagine or ever know. A loving, joyful welcome to your precious baby [boy, girl] and only love, joy and a fast recovery for you! Congratulations! While home is where your beautiful, little one belongs, I'm so glad [he, she] is receiving the tender, loving care [he, she] needs from you and the capable hands of the staff at the hospital. Welcome home to the newest addition to your family. Congratulations! [He, She] is definitely worth the wait. Sending you and your precious little baby [boy, girl] only joy, peace and health today and every day for the rest of your lives. Congratulations! Welcome to the Baby Club, a world of sleepless nights, relentless days and endless laundry. And you'll love every single minute of it. Really. A big congratulations. Your baby is such a blessing — and nobody deserves this blessing more than you. May your entire family be forever blessed! Congratulations! May your beautiful baby boy bring immeasurable joy and wonder into your life. This is what life is all about! A big "congratulations" on your beautiful new arrival. Your precious little baby girl is truly a gift. All your dreams have come true. She is pure magic. Say "hello" to parenthood and "goodbye" to your childhood! Get ready for life's greatest game-changer — your baby — and all the incredibly precious moments that await you. Congratulations on your beautiful bundle of joy. There's absolutely nothing more amazing in this world than the blissful sound of your newborn baby babbling and cooing, except the sound of your baby sleeping. Congratulations! You’re going to make a wonderful parent. You have so much love, affection and compassion to give your baby (boy, girl). You have more choices below! Congratulations! What a lucky baby you have. Your precious new arrival has you as parents. I can't wait to behold the delightful, little smile of your baby boy and the sweet sounds he makes. I'm so happy for you. Congratulations! I just know that you will make your little baby girl’s life as precious as she is. That she is fortunate to have you as her parents is a huge understatement. Wishing you and your new arrival the very best of health and happiness. May your life be filled with countless, unforgettable moments of joy, love and hope. Welcome to parenthood. It's a journey filled with love, joy, hope and wonder. Yours especially so! Congratulations! May the newest arrival to your family bring you the joy, peace and wonder you so deserve. 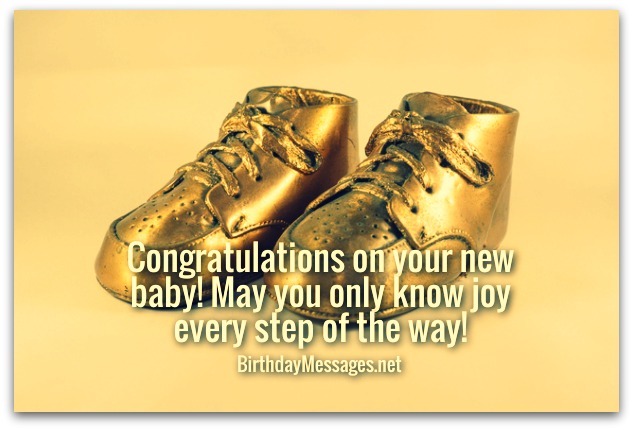 Want to add tips to your baby card message? Around the world, new parents have one thing in common: they all make mistakes during their baby's first year. To help them avoid these gaffes and enjoy every moment of this precious time in their lives, add webmd.com's invaluable tips to your baby card. This is unsolicited advice anyone would appreciate (even the most stubborn, know-it-all, new parents). Find out the 10 mistakes new parents make (and how to avoid them) right now.